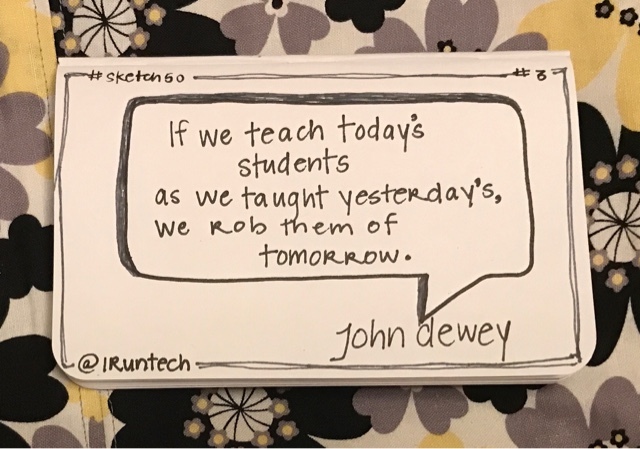 Share your favorite educational quote in the comments below; I'd love to sketchnote it! If you don't have time to do it right, you must have time to do it over - author unknown. Dream big. Start small. But start anyway -- Simon Sinek. Be the change you wish to see in the world -- Gandhi. All really great quotes! I'm on it, Barry! 'The principal goal of education in the schools should be creating men and women who are capable of doing new things, not simply repeating what other generations have done." "Every maker of video games knows something that makers of curriculum don't seem to understand. You will never see a video game being advertised as easy. Kids who do not like school will tell you it's not because it's too hard. It's because it's boring." Love these, Brian! I will have to add them to my list! Voucher codes are so popular that you would find them assigned for almost all kinds of products - grocery, books voucher codes, automobile accessories, clothes, apparels, electronic devices, softwares, computer parts, kids accessories, footwear, watches, flowers, foodstuffs, holiday packages, so on and so forth.